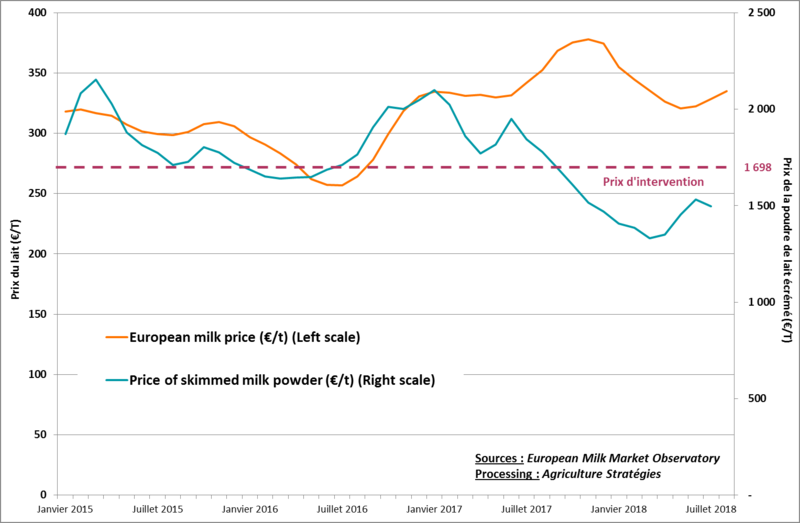 Home>Research and analysis>Drought 2018 in Europe: must we stop selling milk powder from public stocks? 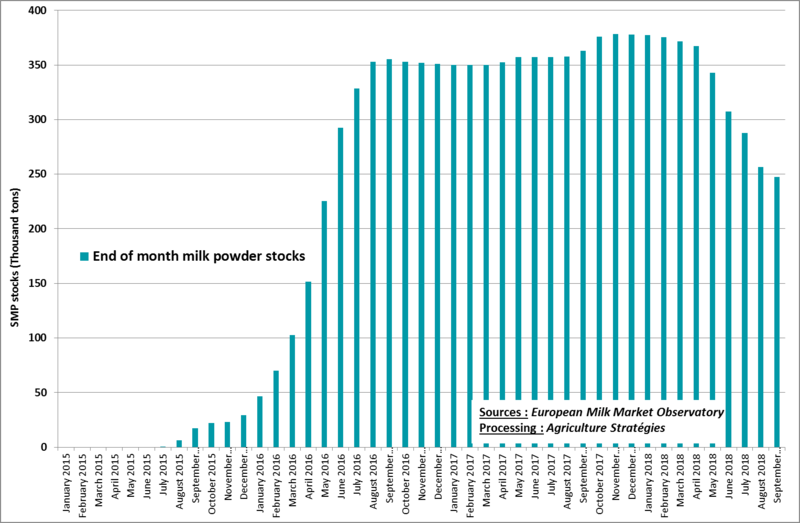 Drought 2018 in Europe: must we stop selling milk powder from public stocks? 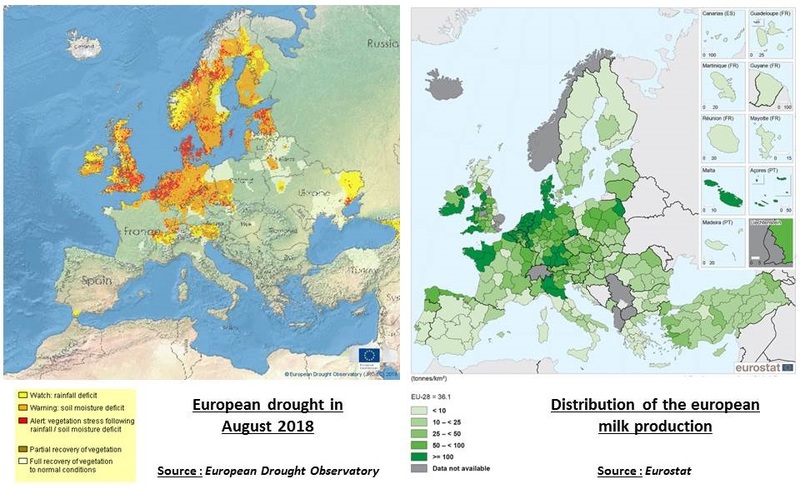 A drought of unprecedented magnitude has affected the northern half of Europe, in an area that accounts for 50 to 60% of European milk production. Affecting both quantity and quality of fodder, the main production indicators have turned to red, suggesting a decline in production over the dairy year. This situation should lead the Commission to revise its strategy: instead of continuing to sell off public stocks from the last crisis of 2015/16, and thus pulling prices down, it would be wise to send a signal of scarcity to market operators by announcing the reduction of these powder sales. Moreover, by refusing to use clearance measures via food aid to the most deprived and through animal feed, the Commission no longer has the range of measures that enabled it to dispose of stocks in 2002 and 2009. The current management of European public stocks is too pro-cyclical – it accentuates cycles – and not counter-cyclical enough because the obsession of the Commission is mainly to get rid of its stocks rather than to drive the single market. The images of the burning boreal forest in Sweden will be remembered as the drought of 2018 that affected the northern half of Europe. 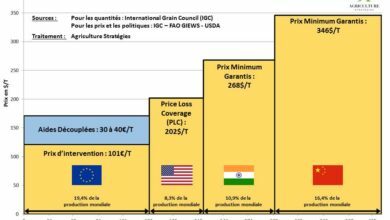 The resulting rise in cereal prices has been widely publicized, although in the end with a price increase of around 20% and a drop in European production estimated between 8 and 10%, we are far from magnitude of the 2007, 2010 or even 2012 grain price spikes. The northern half of Europe is mainly a breeding area, and in particular dairy farming. The concentration of this production is particularly important in the Netherlands, Denmark and northern Germany, which have been particularly affected by the lack of rainfall. The maps below (Figure 1) represent the density of dairy farming and the combined indicator of the European Drought Observatory, which includes information on rainfall anomalies, soil moisture and state of the vegetation. It can thus be estimated that the regions affected concentrate 50 to 60% of the European dairy potential. 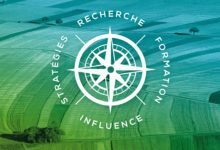 Unlike cereals, where production is directly impacted by a climatic hazard and assessable at harvest, the impact on dairy farming will be postponed as long as the mobilization of forage stocks can compensate for the consequences of the drought. However, production potential will still be affected as farmers seek to decapitalize part of their livestock to optimize the use of self-produced forage and limit external purchases that have become more expensive. 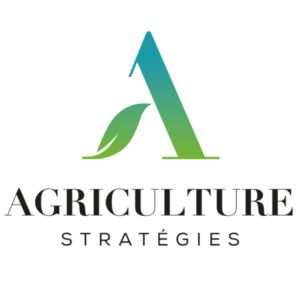 Therefore, establishing production forecasts is uncertain in dairy production, as production is continuous throughout the year and depends directly on livestock producers’ adaptation strategies, which change in particular according to prices. However, it is clear that for the time being (Figure 2) there is no upward movement on milk prices which could offset the rise in production costs resulting from the purchase of fodder. It is therefore quite logical to observe, since the beginning of the summer, an increase in dairy cow slaughter from 5% to 17% depending on the countries concerned, leading to a drop in already sensitive meat prices, with repercussions on the meat farmign sector1. After a spring where milk collection has been rising, there have been significant monthly declines in the monthly collection of milk : 0.8% in Germany, 1.2% in the Netherlands, 2% in France and 3% in Ireland compared to last year. The coming months will undoubtedly confirm this, but it is hard to see how, after 4 years where prices have not covered production costs for dairy farmers, this downward trend in production could be curbed. This is all the more likely that for the moment the average price of milk is still below its level from last year, under the pressure of the management of public stocks that the Commission is struggling to sell despite a price well below the level of intervention. 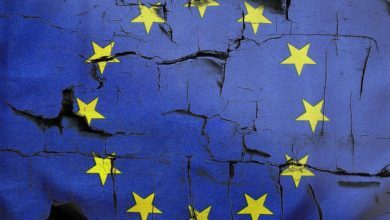 The prospects for reducing European milk production, the leading producer and the world’s second largest exporter, should thus push the regulator of the Community’s public stock, the European Commission, to question its strategy2. The graph below represents the volume of public stocks since the 2015/16 crisis. The sharp drop in milk powder prices triggered public intervention and the reopening of public storage to prevent prices from falling further. With stocks rising rapidly to 350 000 tonnes, well above the theoretical cap of 109 000 tonnes set in the 2013 CAP reform, the Commission having no other choice, even though it was initially refused, had to offer voluntary aid for the reduction of milk production in July 20163. The very good participation of farmers in the program allowed prices to be raised and the use of public storage limited even though for some, greater responsiveness in mobilizing the aid measure would not have led to the accumulation of as many public stocks. Be that as it may, the management of the stocks of powder thus constituted remained to be decided insofar as the effect of a stock is never neutral on the formation of prices, even if in the present case the 350 000 tons represented only the equivalent of 2% of the annual milk production in Europe. In addition, it has also been established that the low price of the powder has led manufacturers to produce less butter, which has led to an unprecedented divergence between the prices of butter and powder4. 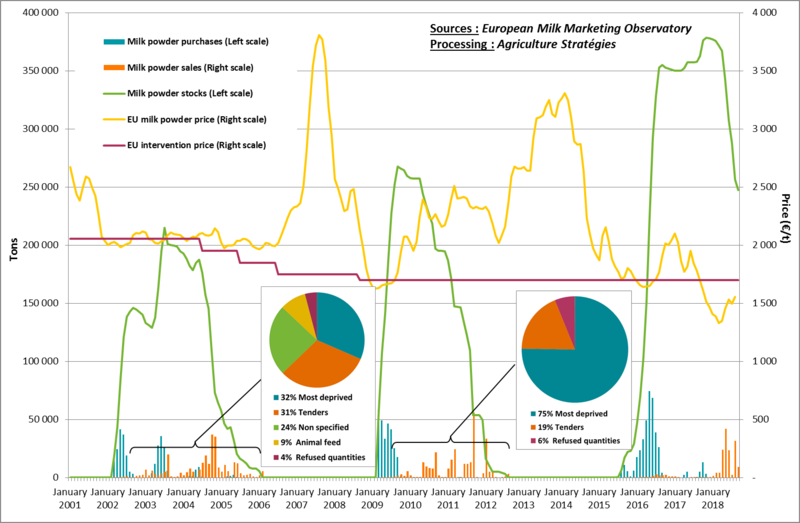 Therefore, since April 2017, the European Commission has offered to sell its stocks of milk powder via a tendering system which in principle offers the regulator the possibility of selling at a price lower than the intervention price in order to get rid of stocks faster (Figure 4). Until December 2017, this procedure did not result in any sales, which led several professional organizations and Member States to unsuccessfully suggest to the Commission to use other disposal measures, and in particular animal feed. It was therefore necessary to wait until January 2018 for the first tenders to take place. From this date until September 2018, this procedure has made it possible to empty a little more than a third of the stocks, ie 142,500 tons out of 378,000 tons, at price levels between 1,000 and 1230 euros per ton, well below the European intervention price of 1698 € / t, which is supposed to be the minimum for the European market. Sure, milk powder can not be kept very long and stocks lose their value. However, this differential is important and leads to questioning given the effect it has on market prices. In fact, the price displayed for auctions has an even stronger influence on the formation of market prices since there is no real transparency on these transactions and quotations are constructed on the basis of the declarations of economical actors. At this price level, we could have expected more powder to be sold. The auctions in April and May were encouraging and allowed for a rapid stock resorption, which would have validated the Commission’s strategy. The result of the auction of September, when only 8 983 tons were sold, is therefore partially counteracting the Commission’s strategy: while the production indicators are looking bad under the effect of drought, potential buyers seem to want to continue to take advantage of the deflationary effect of public stocks rather than anticipating the exit from the bottom of the cycle. At this point, it also seems interesting to consider the precedents. Figure 5 shows the main variables involved following the triggering of public storage in 2002 and again in 2009, as well as the timing and type of measures to empty the stocks. In addition to the calls for tender, the Commission mobilized the food aid program for the most deprived and the animal feed subsidies to sell the stocks. From 2010 to 2012, it was in particular through the assistance program for the most deprived that 75% of stocks had been sold and only 19% via tenders. In view of the price behavior in this period, it is questionable whether tenders, especially by auction at prices below the intervention price, do not have a procyclical effect by pushing prices down. Conversely, the price spikes of 2007 and 2013 occurred in a context where powder stocks were nil. 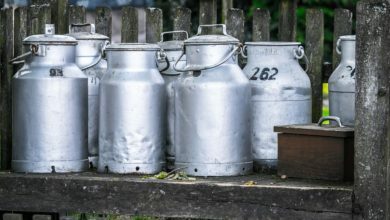 Given the well-known mechanics in agriculture that want the excesses of the prices of one day to make crises of overproduction of the next day, one can also think that the exit of the stocks resulting from the preceding crisis also has a direct repercussion on the next, especially since there are no more milk quotas. 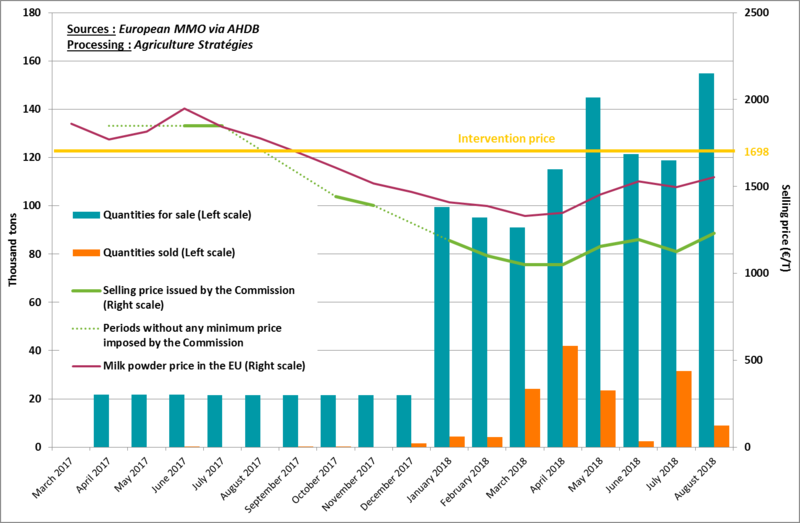 Therefore, in the light of all the elements presented here, it appears that the Commission’s strategy of only using the tender tool to empty powder stocks, even if it means temporarily pushing down selling prices, faces anticipation errors and / or the interest of major buyers that is not to allow a rise in these prices. At this rate it would take at least 2 more years to sell the public stocks resulting from the crisis generated in 2015 by a failed exit from the quota system. 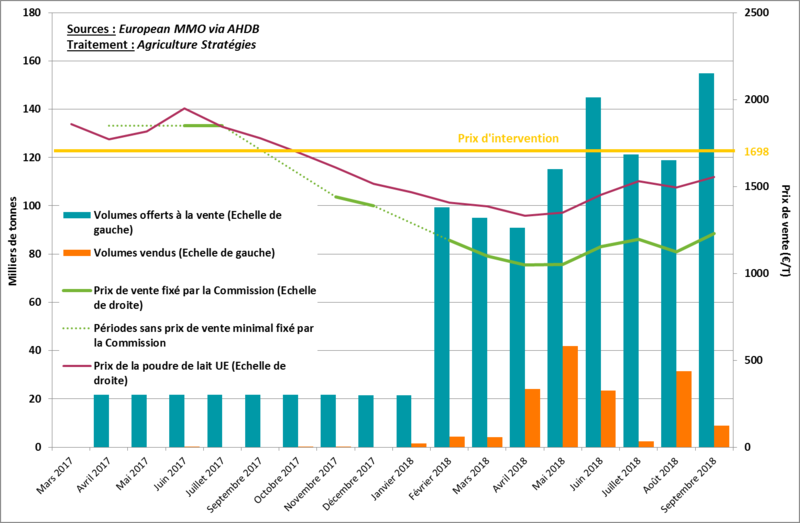 The drought of 2018’s summer entices the regulator of public stocks to question its strategy: either the Commission continues to sell off stocks until the last ton at the risk of causing a price increase later and therefore more abrupt; or it sends a signal of scarcity to the market operators to order them to increase their own stocks, which will increase prices earlier but in a lower proportion than in the previous case. Dairy markets, like all agricultural markets, are not as efficient as economic theory would have it. Maintaining the integrity of the Single market requires the Commission to come out of a binary and pro-cyclical logic where, once constituted, stocks must be sold at all costs. 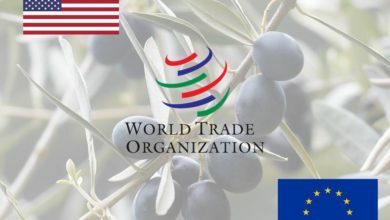 On the contrary, it must develop a counter-cyclical approach to be effective in dealing with crises and not fall into the short-termism of market operators. 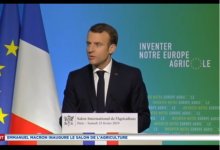 By being more agile, having at its disposal all the necessary levers, and since the producers will also be sufficiently organized to make their marketing more responsible, the Commission will thus be in a position to better steer the cycles and avoid a repetition of crises for the dairy sector. 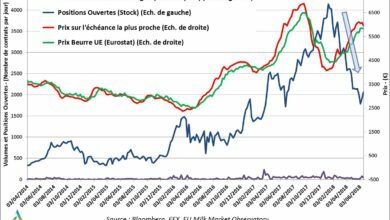 European dairy futures markets : a fatal trust crisis ?